I only vaguely remember how Kyr happened to claim his Panda toy. It was the sample I knit for the second edition of Fuzzy Knits, and was never intended to be played with. But somehow Kyr found it, and the toy spent several months on his bed before it became anything special to him. Since that day, Kyr and Panda have been the best of friends. 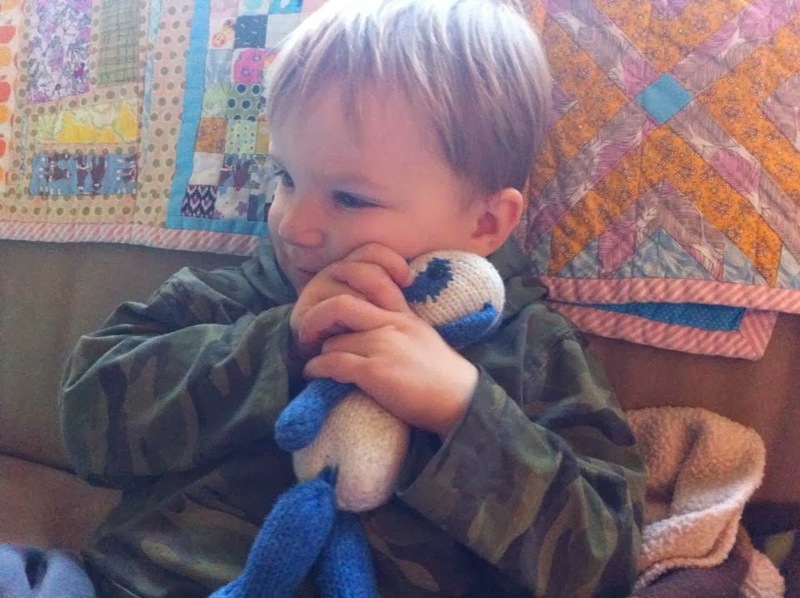 It's often the first thing he asks for when he gets home from preschool, he carries it all over the house with him, he talks to Panda, and he gets us to interact with the toy as well. 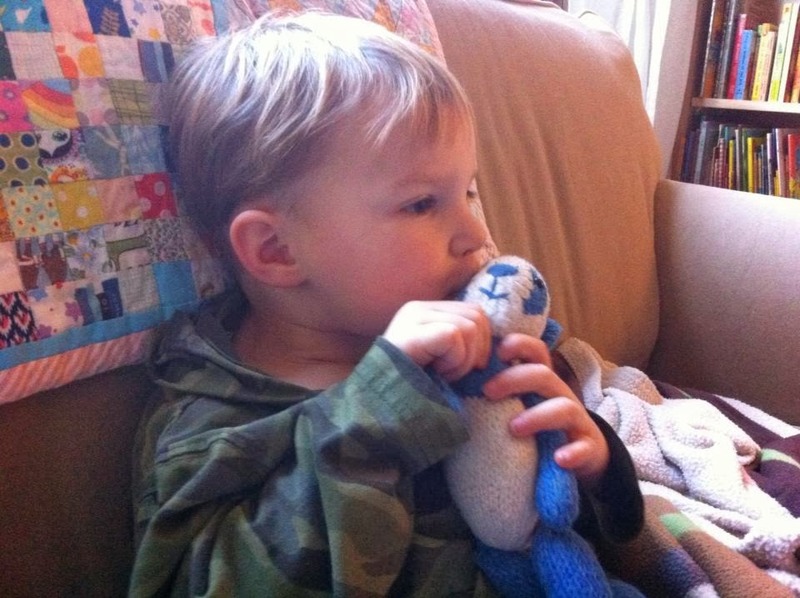 (Thankfully, if we can't find it at bedtime, he'll happily accept that Panda went camping). You can tell just how much Panda is loved in these photos I took yesterday. Kyr told me that Panda had a boo-boo on his head, and needed a band-aid. He specifically asked for a Pinkie-Pie band-aid, since a plush Pinkie-Pie is Kyr's second favourite toy. However, Panda was okay with getting a Cookie Monster band-aid instead. Then Panda got some hugs and kisses to make him feel better. I'm hoping this toy will last as long as Kyr's affection for it does. It's showing a bit of wear, and has needed a few baths. One of these days I re-attach it's arms and legs, as they've become rather loose from being swung around. Panda could do with a little more stuffing too, if I can manage to get his back-seam undone. I'll try to get some photos of the whole process, as I'm sure some of you know of toys who could use a little care. Posted by Barbara Prime at 12:15 p.m.
October 29, 2013 at 12:37 p.m.